It’s a travel day as we leave Seward and head in the direction of Homer with a stop to view another glacier along the way – Exit Glacier. We wind up at a lovely little free camping spot. On the way out of Seward, we stopped to do the hike at Exit Glacier. We can’t get enough of glaciers! One of the cool features here is that they have signs showing where the glacier used to be certain years. It’s crazy to see how much Exit Glacier has receded in the last ten years. The sign posts start on the road before you even get to the park! You’ll also find plenty of pull-outs where you can camp for free along the road to Exit Glacier. The downside to these spots is that you won’t have a cell phone signal. In the video, Kevin also points out the bit of the Harding Ice Field you can see from the ground. It’s over 300 square miles not including the glaciers coming off of it! Bring patience when you come here. It’s a popular attraction. These have been the busiest trails we’ve seen in Alaska and maybe since the Grand Canyon. Exit Glacier is likely a side trip for the cruise ships. There were quite a few tour buses dropping people off. There is RV parking, but it’s not quite long enough for a big motorhome and a toad. If you have a bigger rig, you might have to disconnect your car to park. 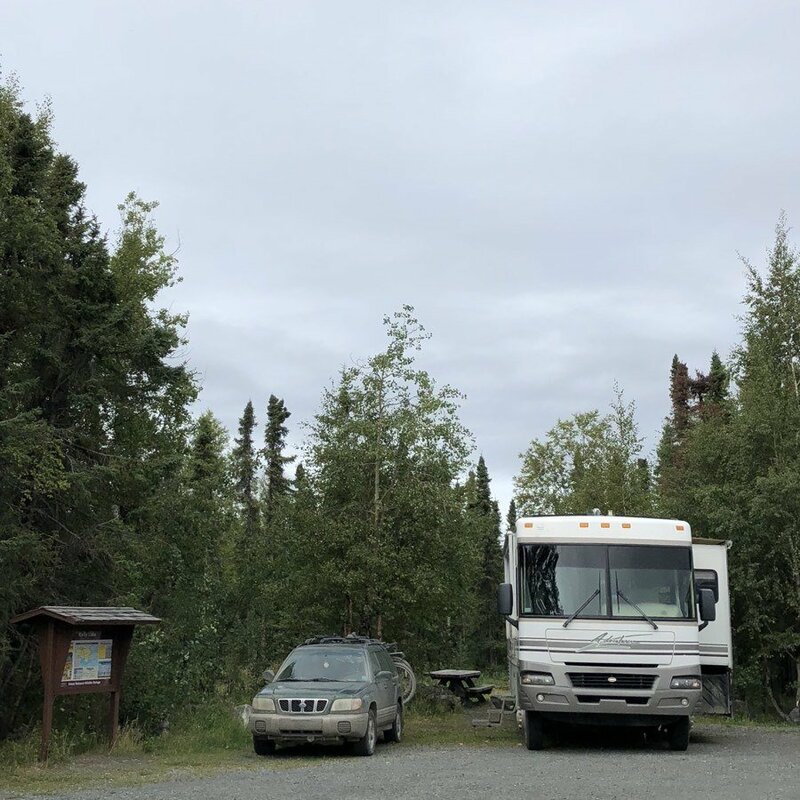 We stop at a free campground in the Skilak Wildlife Recreation Area in the Kenai National Wildlife Refuge called Kelly Lake. There’s room for 4 or 5 campers there depending on the size of your equipment. We were nice and squished together our motorhomes to take up as little space as possible. You’ll find a vault toilet, fire pits, picnic tables, a mini boat launch and a hiking trail there. Plenty to do here considering it’s a free campground. While it exists, the cell phone signal here is minimal, and data speeds are slow. Trying to use the internet for anything but text will be frustrating. If you’re going to be in Seward, don’t miss Exit Glacier! And if you’re compiling a list of free camping in Alaska, you’ll want Kelly Lake to be on it. Next post: Homer, Kenai, and Beluga whales!